There’s good news and bad news in the genetic genealogy world this week. The good news is, things are changing. The bad news is, thing are changing. Unabashedly good news came from AncestryDNA, which finally started officially reporting how much DNA any two people who match each other have in common. With any match open, there is now a little icon with the predicted relationship that’s a letter i in a circle. Click on that and you get information we never got before. Measured in centimorgans (cM), we can now see that someone reported as an extremely high confidence match as a predicted second (actual third) cousin shares 140 cM of DNA with The Legal Genealogist — a very good match indeed, and one well worth spending a lot of time collaborating with. We can also see, at the other end of the spectrum, that a match reported as a moderate confidence match and distant cousin shares only five cM of DNA with me — and, quite frankly, that’s a match at a level where we’re unlikely ever to identify the common ancestor. This level of reporting is a very welcome addition to the information from AncestryDNA — the first really solid analytical data that isn’t tree-dependent. So kudos to AncestryDNA for providing this! 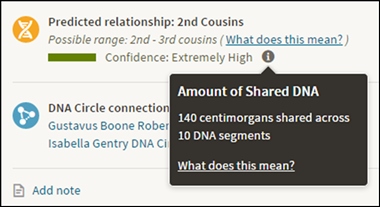 AncestryDNA also reports, with the amount of DNA we share with a match, how many segments we have in common with that match: how many individual pieces of DNA are likely shared because of common descent. This isn’t as useful as the total amount of DNA in common, because part of the algorithm used by AncestryDNA results in skewing these numbers particularly for close matches. Here’s the deal: AncestryDNA has a system called Timber that identifies, and removes, areas from its reporting system where it looks like there are huge numbers of people who share those segments just because they’re human, or European, or Greek — rather than because they share a common ancestor. That’s a good thing, usually, since it removes a lot of false positive matches. But the result is that it really wreaks havoc with the number of segments reported. Every parent should share exactly one very long segment on every autosomal chromosome with each of that parent’s children. That’s because each child inherits one entire chromosome out of each autosomal pair of chromosomes from each parent. So — on any given autosomal chromosome — there should be one, and only one, shared segment between a parent and a child. Twenty-two autosomal chromosomes, 22 autosomal segments shared. But when you remove those Timber segments from consideration, what you get instead of one long shared segment is lots of smaller shorter segments shared between parent and child. My first cousin has had both of her parents tested: AncestryDNA reports that she shares 89 segments with her father and 102 with her mother. So, for the time being at least, the Timber system combined with the segment reporting system isn’t good news at all. The biggest changes on the horizon are those over at 23andMe where the entire reporting system is about to be up-ended. An entire new set of rules go into effect this Wednesday, November 11th, so time is running out for those of us who’ve tested there to collect information about existing matches that could very well disappear as of Wednesday. I’d give you an entire laundry list of things you can do to maximize your chances of keeping information you already have and being able to ensure that you are best positioned to take advantage of the changes there… but I don’t need to. Shannon Christmas has already done it, yesterday, in a post on his blog, Through the Trees. The post, Prepare for The New 23andMe, gives you step by step instructions, with screen captures, on just what to do to make sure you keep as much as can be kept of the utility of the existing 23andMe system and position yourself to benefit the most from the new system there. So head over to Through the Trees and Prepare for The New 23andMe. The winds of change are a-blowing… and we all need to keep abreast of what’s happening to make the most of our DNA test results. I figured the reason for the high number of segments was due to Timber and your post confirmed it. Thanks. Yep, definitely a Timber issue. Ancestry.DNA’s centimorgan data is also post-Timber. For endogamous populations like mine this is a huge benefit making the reported data far more useful. It’s probably better data for most other populations as well. If the price of that is getting not-so-useful segment numbers, I think Ancestry made the right choice. The segment data tends to be more useful for more distant matches anyway, isn’t it? Those would seem less likely to be adversely affected this way. There are some populations that have been affected negatively. African-American researchers in particular report negative side-effects from Timber. For those of European ancestry, and endogamous European populations, it’s generally a good thing. Unfortunately, your match is with me and only with me and not with any of my other kin who’ve tested (including a maternal aunt and uncle) — so we’re not being pointed in any particular direction. It’s possible the link is on my German father’s side and not my mother’s southern US side at all. If you’ve uploaded to Gedmatch, feel free to send me your Gedmatch kit number (the Ask TLG link at the top of every page works) and I’ll double-check there as well. But right now, with a single segment in common and not even a hint as to where our common ancestry might be, yes, we’re at a level where finding that common ancestor may turn out to be impossible. Family Tree DNA is also making some changes according to its FaceBook page. “Good news! We’re making critical updates to our Family Finder pipeline. That means autosomal transfers will be disabled until Nov 12, 2015. This is one part of the update that will enhance our autosomal products to provide a more precise genealogical tool. Now if we all could convince our matches at AncestryDNA to at least do/buy a autosomal transfer to FTNDNA so we can see in the chromosome browser where we match. And if not FTDNA (which is my first choice), then GedMatch (which is free). Just wanted to make it clear for all that DNAGedcom has the ability to download ALL your COA downloads at one time. You won’t need to do it for each and every one of your shares. Just subscribe and login and go to the 23andMe tab. Be sure to use your 23andMe e-mail address and 23andMe password. Your username and password is not kept and is not stored anywhere on the system. Thanks for that reminder, Rob! DNAGedcom is a FABULOUS tool. Oddly, on all of my ? I still only get the generic descriptions of what the suggested match might mean. Is the centimorgan and segments feature being rolled in? Only if you have a tree on Ancestry? Hmmm. Thanks for any suggestions. I don’t know of any categorical restrictions, so a roll-out is most likely. You might also try logging completely out of your Ancestry account and then logging back in. I took the DNA test thru Ancestry.com. I wasn’t completely aware of what a bogus piece of junk it was, until I got my results back, and started looking over them. Much to my surprise, and to my family as well, all those ancestors who came to this country over 425 years ago, we’re not from England, they came from Ireland. Which is truly odd, considering no one in my family has ever been listed from Ireland. Mind you, I do love lots of things about the country, including its people, but my ancestors, had or have never set foot upon that land, and that includes as of today! It’s not “bogus” at all, unless you thought those percentages were going to be real science. That’s the only part of the test or its results that might be considered questionable. I would suggest that you look at the map for the areas covered each particular country in the ethnicity estimates. Many of them extend beyond the country under the heading, which would explain why your English ancestry could be listed under Ireland. I’m an adoptee who found my birthfather’s family through AncestryDNA, so it was definitely not “bogus” for my purposes. The more people who are added, the more people who will have successes like mine, so I hope you don’t continue to deter everyone because of your misunderstanding of the information provided. Hello, I am more than pleased with this new tool from ancestry. I was not aware of this new tool until I read about it on your site. I have been able to prove a third cousin by the amount of d N A that we share. Also during a recent call to ancestry the pleasant young man informed me that ancestry are working to isolate the Welsh and Scots D N A from the G B. This would be good news indeed should they have any success with this. I have requested ancestry look at my cousins ethnic results again as she feels that the result is correct but in the wrong order. Only 2% G B which in her case has to be wrong. It is my understanding that a parent will share more than one segment per chromosome with each child due to the recombination that takes place during meiosis. A child gets one of each pair of autosomal chromosomes from each parent, but the chromosome he or she gets is a mix of the parent’s pair of chromosomes, so that there will be multiple segments from each of the parent’s two original chromosomes.